Manky Kongs are Kong reject orangutans and enemies in Donkey Kong Country. Their name even derives from the primarily-British slang term "manky", meaning "dirty", while also playing on the word's similarity to "monkey". A Manky Kong throwing a Barrel in Orang-utan Gang. Manky Kong holding the letter J in the Game Boy Color port. Manky Kongs attack Donkey Kong and Diddy Kong by throwing an endless supply of barrels in their direction, of which the Kongs must avoid. Some Manky Kongs throw barrels at a faster rate than others. Every Manky Kong stands in one spot and does not move around. 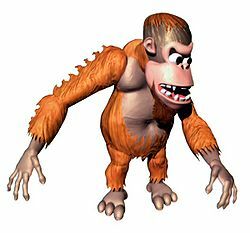 The Kongs can defeat Manky Kongs similarly to other basic enemies, such as Gnawty, by either jumping on its head, rolling into it, or throwing a Steel Keg at it. Manky Kongs first appear in the level Orang-utan Gang, where they appear standing on the treetops all throughout. They also appear in Oil Drum Alley, Trick Track Trek, Blackout Basement, and Loopy Lights. Manky Kongs usually throw barrels from a height, which effectively protects themselves from the Kongs. In the Game Boy Color port, the player can print a sticker of Manky holding the letter J from the Game Boy Printer, from the selection menu's "ALPHABET" option of the PRINT sub-menu. In the Game Boy Advance port, a photograph of a Manky Kong is obtainable at Orang-utan Gang. The photograph is floating above the pitfall leading the first Bonus Level. The photograph appears on the fourth page of the Scrapbook. Manky Kong later appears as a collectible sticker in Super Smash Bros. Brawl. The sticker is only usable by Donkey Kong or Diddy Kong, and it boosts the strength of arm attacks by ten. Unlike most of the other Kongs, they are shown having four fingers and toes instead of five. Chunky Kong (as well as Lanky Kong in Donkey Kong 64), also have this distinction. In the Japanese version of Donkey Kong Country, Diddy Kong must hit a Manky Kong twice to defeat it. However, in the game's international releases, Diddy Kong can defeat them in a single hit. 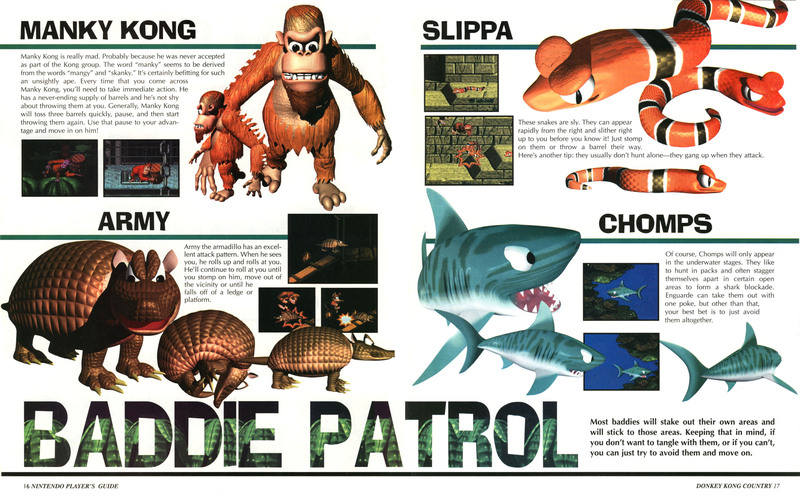 ↑ Donkey Kong Country Nintendo Player's Guide, Page 16. This page was last edited on February 26, 2019, at 12:23.